A few months ago I had the pleasure of being invited to Hampstead. An author had stumbled across the blog and wanted to introduce me to their local. Always pleased to be introduced to a new bookshop, I immediately took them up on their offer. I got myself on the train to Hampstead station, where I arrived early and stood under the clock waiting for Guy Fraser-Sampson. Admittedly, this is a story of falling in love with a bookshop, rather than a romantic encounter at a train station, but it's love all the same. But before we got to the main event, Guy took me on a tour of the area picking out some of the sights while we talked books, the universe and everything. 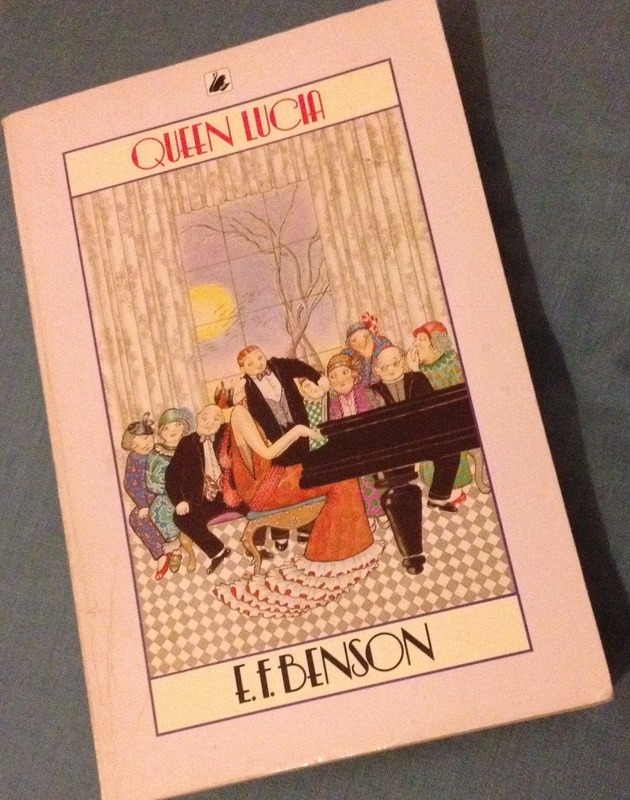 He's written a number of books himself, but we 'Twitter met' through talks about his continuation of E F Benson's Mapp and Lucia series and so I enjoyed hearing about his first encounter with the books and subsequent enthusiasm for the characters. It's an enthusiasm that's catching: Guy's a fascinating character himself and as his next book launches in the coming weeks I definitely recommend going along to one of the events to meet him in person. Before I knew it, Keith Fawkes bookshop appeared out of nowhere as we walked down a delightfully-named side street. If it hadn't been pointed out to me I might possibly have missed it, as it was hidden behind a mass of antiques. Had my car been nearby I could easily have shopped here as well as inside, but that's a shopping trip for another day. Walking beyond the antiques, the first thing bookshoppers encounter is a wall of books and a corner leading around to a corridor of books. 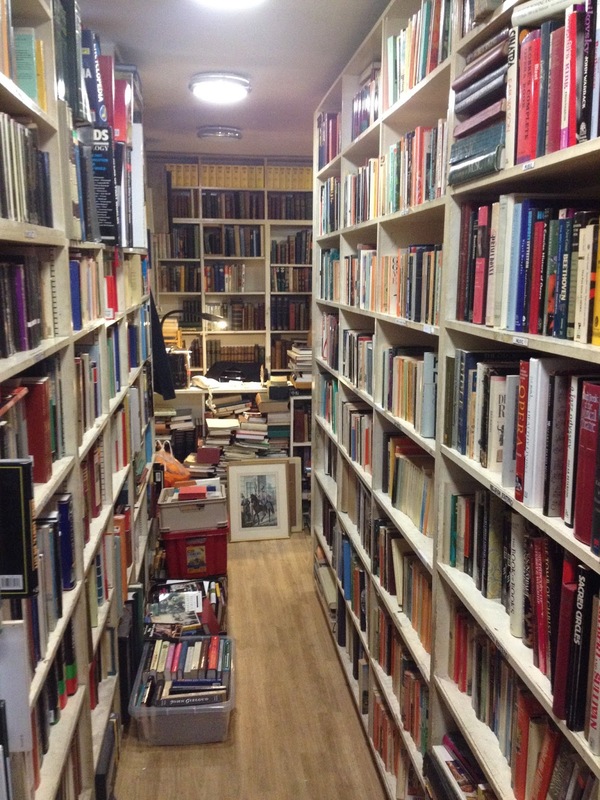 Not one for the claustrophobic, the bookshop's narrow walkways are well worth an investigation for the secondhand gems they hold, and part of the experience of this venue is juggling your way between other browsers. The shop wasn't overly busy when we were there, but space was snug and passing strangers forced to be a little on the friendly side. 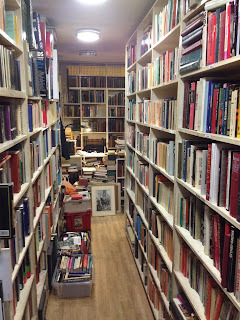 Continuing my conversation with Guy, we picked out favoured books and enjoyed the ever so slightly untidy but friendly atmosphere of the shop, which has a great variety of stock if you're willing to take the time to browse. 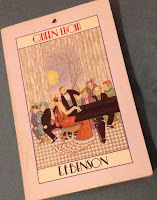 I was particularly taken with the realisation fiction is arranged by century, suddenly appreciating which authors were contemporaries and enjoying the challenge of remembering who wrote not only what but when. It was an unusual way of browsing but one I very much enjoyed. Meantime, if you'd like to know more about Keith Fawkes (and other bookshop-related things), you can't go wrong if you have a read here. I've enjoyed having a wander through this shop before. It's really a case of digging and discovering here - which is great fun. I also enjoy that fiction is arranged by century. It makes interesting pairings. Great to read about your experience! Thank you. I'm pleased to see you enjoyed the century organisation too, it's made me think much more about the various dates of books on my own shelves.